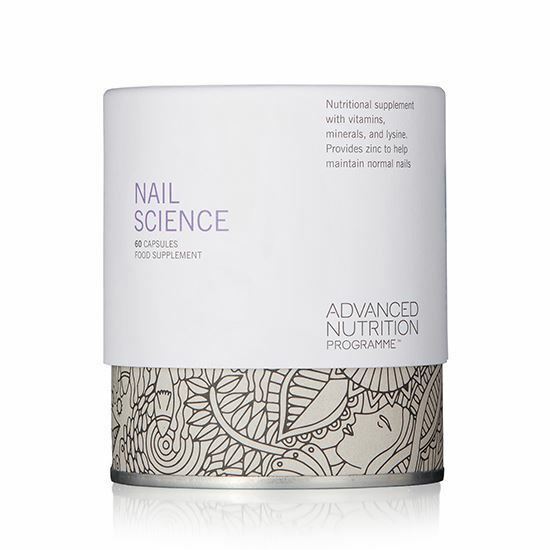 NAIL SCIENCE | iiaa Ltd | The UK and Ireland distributor of Environ Skincare, jane iredale makeup and Advanced Nutrition Programme. INGREDIENTS Calcium Gluconate, L-Lysine Hydrochloride, Capsule Shell (Hydroxypropyl Methylcellulose), Pantothenic Acid (as Calcium Pantothenate), Horsetail Extract 4:1 (Equisetum arvense), Vitamin E (as D-Alpha Tocopherol Acetate), Silicon Dioxide, Iron Citrate, Zinc Citrate, Anti-Caking Agent (Magnesium Stearate), Bulking Agent (Cellulose), Acacia Gum, Vitamin B6 (as Pyridoxine Hydrochloride), Modified Tapioca Starch, Biotin, Copper Gluconate, Sunflower Oil, Vitamin B12 (as Hydroxycobalamine), Sucrose, Corn Starch, Folic Acid, Vitamin A (as Retinyl Palmitate), Antioxidant (Natural Mixed Tocopherols), Vitamin D (as Ergocalciferol). NO ADDED: salt, starch, wheat, gluten containing ingredients, yeast, lactose, dairy products, artificial preservatives, colours or flavourings.